Unfold the crust. Place the bottom of a springform pan on top of the crust as a template and trim it about 1 inch larger all the way around than the pan. If you don’t have a springform, unfold the crust onto a baking sheet. Place the trimmed crust in your springform and press gently to the shape of the pan. Roll the excess crust into ropes and place it around the inside edges of the bottom crust. Use your fingers to press them together to form a decorative edge. If you’re not using a springform, simply fold up the edges of the crust twice and shape into a nice decorative border. Prick crust about a dozen times with a fork to prevent bubbling up. Pour some dried beans evenly over the crust. This will also help keep it flat. Bake according to package directions. Cool crust. Tip: Keep the cooled beans in a plastic bag or jar where you store your pans so you’ll have them the next time you bake a pie. Heat apricot jam in a saucepan until it just starts to bubble. Remove top of springform pan and brush a layer of jam across crust. 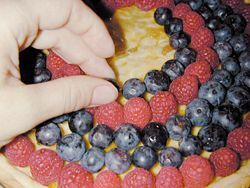 Starting near the outside crust, form concentric circles of alternating berries until you’ve reached the center. If you have more blueberries, you may want to double up on blueberry rows, or play it by ear and plan on a blueberry-dense center if you run out of raspberries. Rewarm jam if necessary until it’s thin again. Brush carefully over the top of the fruit. Dust with powdered sugar, if desired. 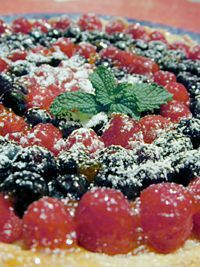 Serve with whipped cream and an additional dusting of powdered sugar. This entry was posted on Thursday, September 13th, 2007 at 7:16 am	and is filed under Desserts, Holiday & Seasonal, Master Recipe Index, Speed Queen (30 min/less), Vegan or Vegan-able, Vegetarian. You can follow any responses to this entry through the RSS 2.0 feed. You can leave a response, or trackback from your own site.